The deadline to register for the ticket lottery is this Friday, April 22, at 10 a.m. PT. 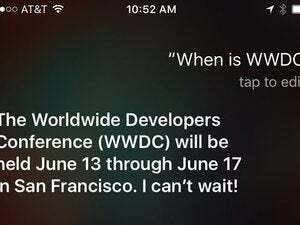 After Siri provided a sneak peek at the dates for Apple’s 2016 Worldwide Developers Conference, the Cupertino-based company confirmed the event by launching its WWDC 2016 website. WWDC starts on Monday, June 13, and runs throughout the week until Friday, June 17. WWDC actually takes place at two venues. Monday, the day of the keynote, will be at the Bill Graham Civic Auditorium. The rest of the week will be at Moscone West, where WWDCs in recent past have been held. The keynote on June 13 starts at 10 a.m. PT, and according to the WWDC website, will be streamed live on the web. Apple will also stream select WWDC sessions and post videos of all the sessions. If you are interested in attending WWDC, you must register for a ticket lottery. If you are selected, you have an opportunity to buy a ticket for $1599. The deadline to register is this Friday, April 22, at 10 a.m. PT. Apple will notify you of your ticket status by Monday, April 25. For students 13 years of age or older interested in attending WWDC, Apple is offering scholarships that grant free admission to WWDC and possible travel assistance. You must be a member or alumni of a STEM organization, and you must submit an app that you have worked on that “demonstrates creative use of Apple technologies and runs on an Apple platform.” The deadline for scholarship applications is Sunday, May 1 at 5 p.m. PT. Applicants will be notified of their statues by Monday, May 9.